Alan MacGregor Cranston (June 19, 1914 – December 31, 2000) was an American politician and journalist who served as a United States Senator from California, from 1969 to 1993, and as President of the World Federalist Association from 1949 to 1952. Born in Palo Alto, California, Cranston worked as a journalist after graduating from Stanford University. After serving as California State Controller, Cranston won election to the Senate in 1968. He became the Senate Democratic Whip in 1977 and held that position until 1991. In 1984, Cranston sought the Democratic presidential nomination, advocating a nuclear freeze during the later stages of the Cold War. He dropped out after the first set of primaries. In 1991, the Senate Ethics Committee reprimanded Cranston for his role in the savings and loan crisis as a member of the Keating Five. After being diagnosed with prostate cancer, he decided not to run for a fifth term. After his retirement from the Senate, he served as president of the Global Security Institute and advocated for the global abolition of nuclear weapons. Cranston was born in Palo Alto, California, the son of Carol (née Dixon) and William MacGregor Cranston. He attended Pomona College for one year, studied abroad for a summer at the National Autonomous University of Mexico before graduating from Stanford University in 1936 with a degree in English. Cranston was a correspondent for the International News Service for two years preceding World War II. When an abridged English-language translation of Adolf Hitler's Mein Kampf was released, sanitized to exclude some of Hitler's anti-semitism and militancy, Cranston published a different translation (with annotations) which he believed more accurately reflected the contents of the book. In 1939, Hitler's publisher sued him for copyright violation in Connecticut; a judge ruled in Hitler's favor and publication of the book was halted, but by then a half million copies had been sold, helping inform a wide audience about the threat Hitler posed. A Democrat, Cranston was elected California State Controller in 1958 and re-elected in 1962, and defeated for reelection in 1966. During his first few months in office, Cranston introduced a resolution calling for President Nixon to halt closing 59 Job Corps Centers. He amended the original resolution to include a June 30 deadline that would allow Congress to do a study into the targeted facilities and removed language critiquing the Nixon administration for doing damage to the lives of trainees by closing the facilities down. In late April 1969, the Senate Labor and Public Welfare Committee approved the revised Cranston proposal in a vote of 10 to 6. Cranston predicted victory for the resolution when it was taken up for a vote by the entire chamber. The Senate rejected his proposal on May 13, 1969, by a vote of 52 to 40. In a September 12, 1971 statement, Cranston disputed claims by the Pentagon that military manpower and national security would be threatened by Congress not renewing President Nixon's draft authority and stated that he would filibuster the draft measure. In September 1973, Cranston introduced an amendment that would reduce American forces overseas by 20 percent in the next year and a half and would include Naval forces. It was introduced as a fallback amendment to the 40 percent reduction in American forces overseas proposal offered by Senator Mike Mansfield. In November 1973, Cranston announced his support for the nomination of Gerald Ford as Vice President. He stated his support came after consulting "several hundred persons — Democrats and Republicans, business and labor leaders, elected politicians and party functionaries —in his own state of California" and finding Ford to have little opposition. On April 23, 1974, Cranston stated that members of the Veterans Administration were encouraged to contribute campaign contributions to the re-election campaign of President Nixon and that head of the Veterans Administration Donald E. Johnson was privy to these activities. Cranston's allegations were verified later that day by a former employee of the VA who admitted being solicited for contributions. In 1979, after nineteen senators signed a letter indicating that their support for the SALT II treaty was hinged on President Jimmy Carter's response to its impact on U.S. defense posture, Cranston stated that their concerns were legitimate but mostly did not "relate directly to the text of the SALT II treat" and it was likely their hope that their issues with the treaty could be resolved without the usage of killer amendments. In March 1981, Cranston was one of twenty-four elected officials to issue a joint statement calling on the Reagan administration compose a method of finding a peaceful solution that would end the Ulster conflict. In April 1981, during a Senate floor speech, Cranston asserted that India and Pakistan had entered the final stages of their preparation for nuclear test sites, speculating that India "will decide to make another test at the Pokaran site in the next few months" and Pakistan "could produce the fissile materials for a similar test, perhaps by the end of this year, most likely by the end of 1982." While Cranston did not identify the source of his information, senior officials in the Reagan administration verified "the gist of Senator Cranston's information." On October 2, 1990, Cranston was one of nine senators to vote against the nomination of David Souter for Associate Justice on the Supreme Court. Cranston was reprimanded by the U.S. Senate Select Committee on Ethics for "improper conduct" on November 20, 1991, after Lincoln Savings head Charles Keating's companies contributed $850,000 to voter registration groups closely affiliated with the senator. Keating had wanted federal regulators to stop "hounding" his savings and loan association. 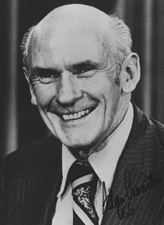 Although the committee found that "no evidence was presented to the Committee that Senator Cranston ever agreed to help Mr. Keating in return for a contribution," the committee deemed Cranston's misconduct the worst among the Keating Five. Cranston decided against running for a fifth term while he battled prostate cancer. ^ "Alan Cranston, Former U.S. Senator, Is Dead at 86". The New York Times. January 1, 2001. ^ Farrell, Harry (November 21, 1999). "Out of the limelight, former U.S. Sen. Cranston fights a battle for peace". San Jose Mercury News. Archived from the original on August 15, 2000. ^ Jonathan Schell (January 4, 2001). "Alan Cranston". The Nation. ^ a b "Senate Vote on Jobs Corps Center". New York Times. May 14, 1969. ^ "Cranston Predicts Job Corps". Independent. May 1, 1969. ^ "CRANSTON DISPUTES PENTAGON ON DRAFT". New York Times. September 13, 1971. ^ "Senate Votes, Then Voids, 40% Cut in Troops Abroad". New York Times. September 27, 1973. ^ "Democratic Liberals Divided on Ford". New York Times. November 27, 1973. ^ Rosenbaum, David E. (April 24, 1974). "Cranston Says V.A. Employes Were Solicited for Nixon Gifts". New York Times. ^ "Carter to Meet 19 Senators 'Concerned' About SALT". Washington Post. December 17, 1979. ^ "The 10 Messiest Band Breakups". Rolling Stone. Retrieved 13 August 2013. ^ Ellwood, Alsion (Director) (January 19, 2013). History of the Eagles Part One (Documentary). Showtime. ^ "24 POLITICIANS URGE U.S. ROLE IN ENDING ULSTER STRIFE". New York Times. March 17, 1981. ^ "CRANSTON SAYS INDIA AND PAKISTAN ARE PREPARING FOR NUCLEAR TESTING". New York Times. April 28, 1981. ^ "Alan Cranston, Former U.S. Senator, Is Dead at 86". New York Times. 1 January 2001. Retrieved 10 October 2014. ^ Berke, Richard L. (October 3, 1990). "Senate Confirms Souter, 90 to 9, As Supreme Court's 105th Justice". New York Times. ^ "Senate vote on Souter". UPI. October 2, 1990. ^ Bock, Alan: Eye on the Empire, Antiwar.com. This page was last edited on 22 March 2019, at 18:21 (UTC).